During fall, spring and summer my kids play sports so at least 2 days out of the week are games and 2 days are practices so there is always something going on!! So Go Head and Ask me "What do you do all day?" No I'm not perfect, my kids do watch TV, some days I spend too much time online, but I never have laundry piles to be washed or put up, my house is usually relatively clean, I always get dressed in the mornings, My kids always have a cooked meal for dinner, our homework/projects are done, and we get to spend time together, my kids are healthy and happy and I think that I'm doing pretty good! I'm not perfect but I can guarantee you I don't lounge around in my pajamas all day eating bonbons on the couch watching cheesy soap operas doing nothing! 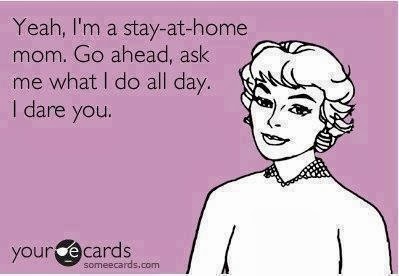 Some days I think a "real job" as many call it would be way easier than my daily routine. I get up with kids in the middle of the night and still have to get up when My alarm goes off in the mornings I have very important responsibilities and I pride myself in doing my "job" the best I can and I enjoy my "job" very much! 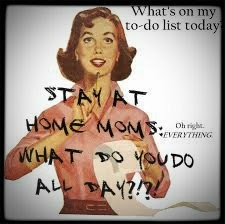 What are your tips for being a Stay at Home Mom & Dealing with the Question of "what do you do all day?" ?